One year old. My tiny baby is ONE YEAR OLD. I'm not even sure I understand how this happened... it seems like just yesterday, I was finding out I was pregnant... and the next thing I know, nine months had passed, and I was delivering her... and now 12 (!!!) more months have passed, and she's already a toddler and no longer a little baby. Life sure isn't fair that way. 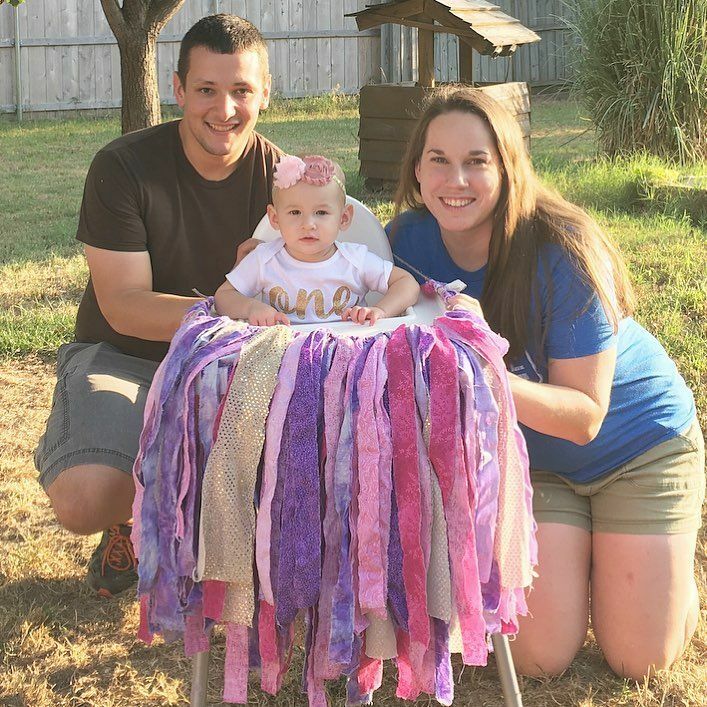 We celebrated Annabelle's birthday two days early over Labor Day weekend so family could be in town. It was small since nearly all of our friends were traveling for the long weekend (they don't get many breaks in pilot training, so when they have the opportunity, they take it! ), but it was so much fun anyway. 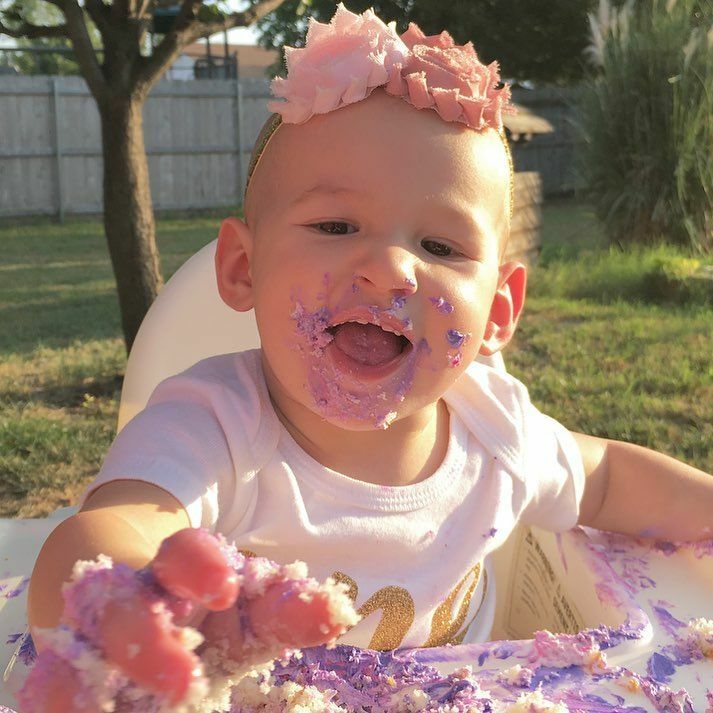 Little Miss enjoyed all of the attention, getting to be outside, and of course her cake and ice cream. I think we created a monster, though. She now loves sweets. Oops. The next day, we all went swimming in the hotel pool that my family was staying at. Annabelle just loves being in the water, so we knew it'd be a fun birthday activity for her. 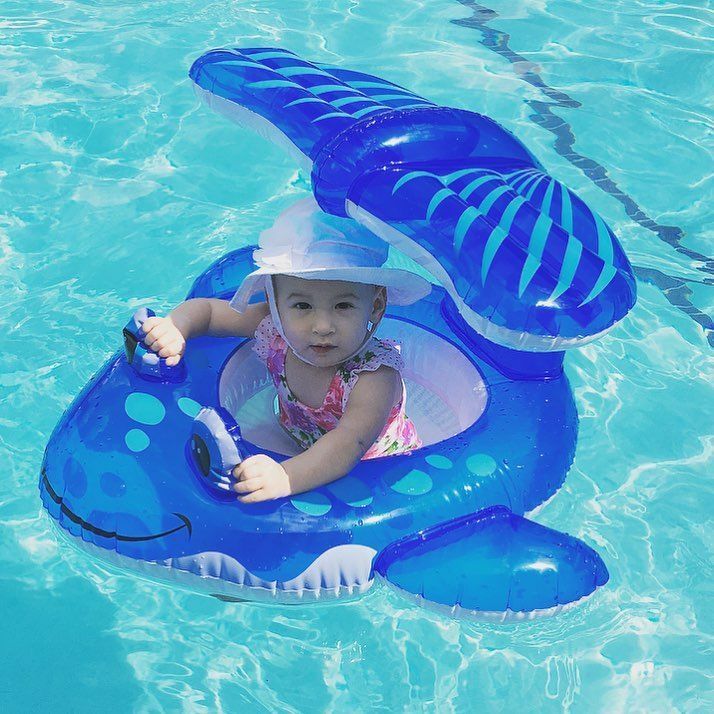 She loves her whale, but she also loves trying to dive out of it. Little Miss Independent just wants to do everything on her own. 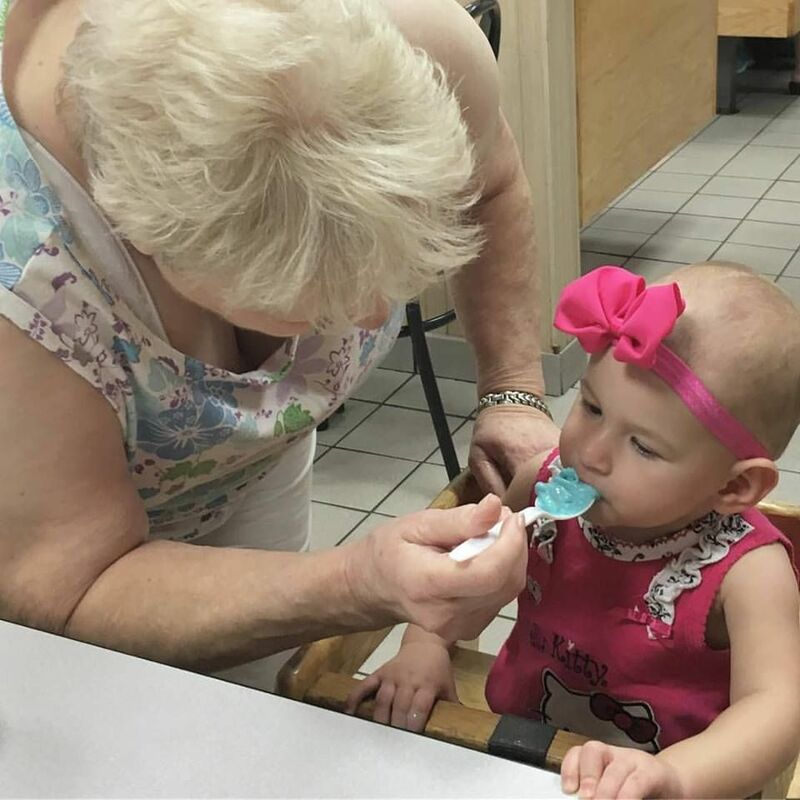 After swimming, we went to Braum's, where her great grandma got her some blue birthday cake ice cream - her first time eating ice cream at a restaurant! She loved it and kept diving in for more with her mouth open. Dan and I had an unexpected date night after all of that since family was around to watch Annabelle. 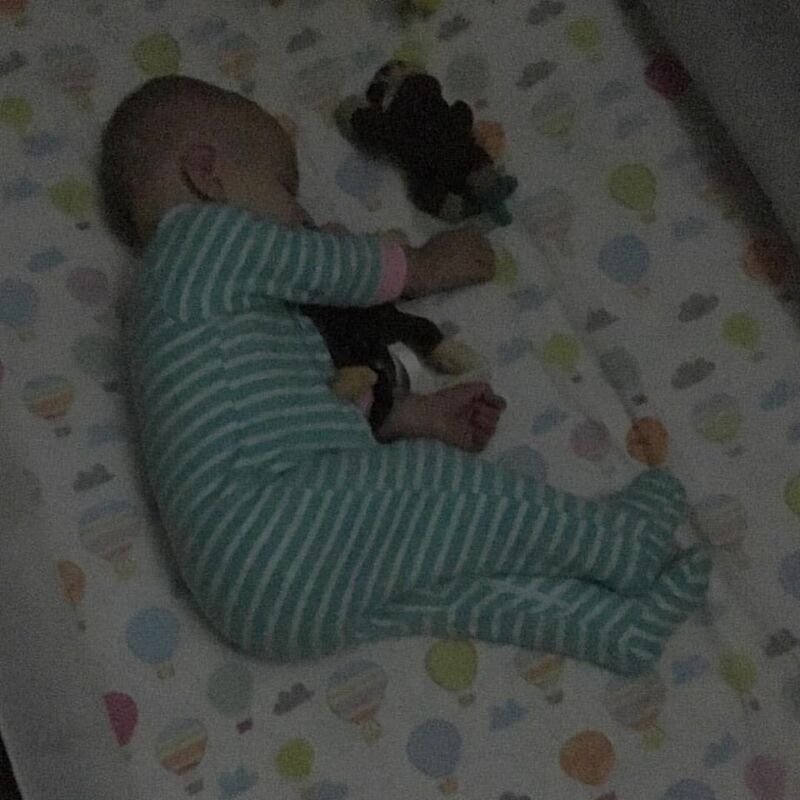 We had a fun time, but then I realized how upset I was that I didn't get to put her to bed myself on her last night as a little baby... so we snuck into her room when we got home so I could take a picture of her last sleep before she turned one. Look how peaceful and angelic she looks. Aww. And that was her last night in that size of pajamas too - she's now fully into the 9 month size there! My sweet tall girl. 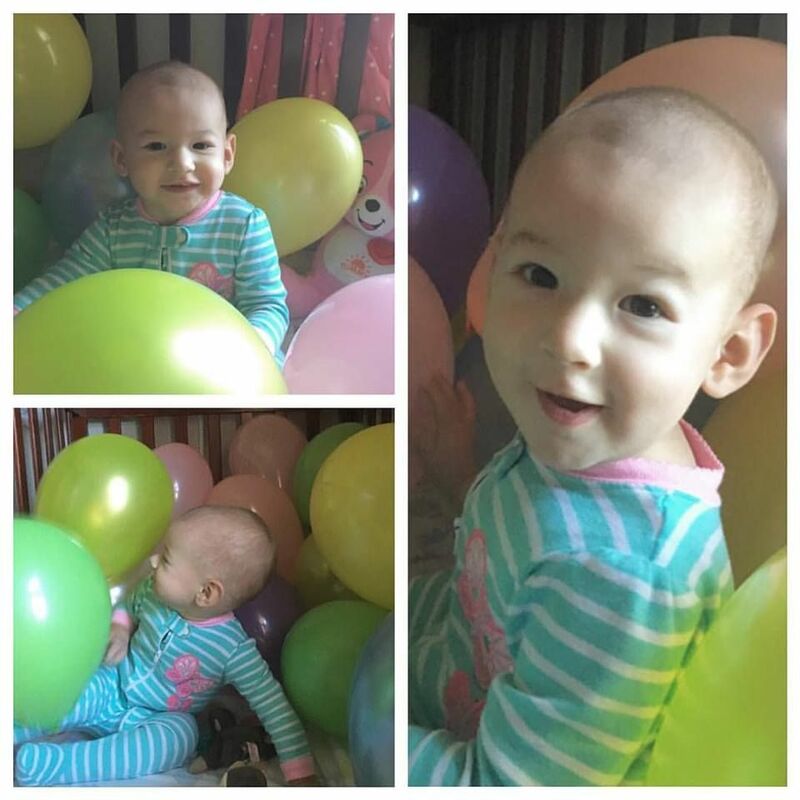 When she woke up, we had a little balloon party in bed! Dan helped me blow up all the balloons the night before, and she was so amazed at them. I don't think she'd ever seen one, let alone played with one, before. She loved having them around, and we let her play for about a half hour (supervised, of course). Her little face is filled with such joy! 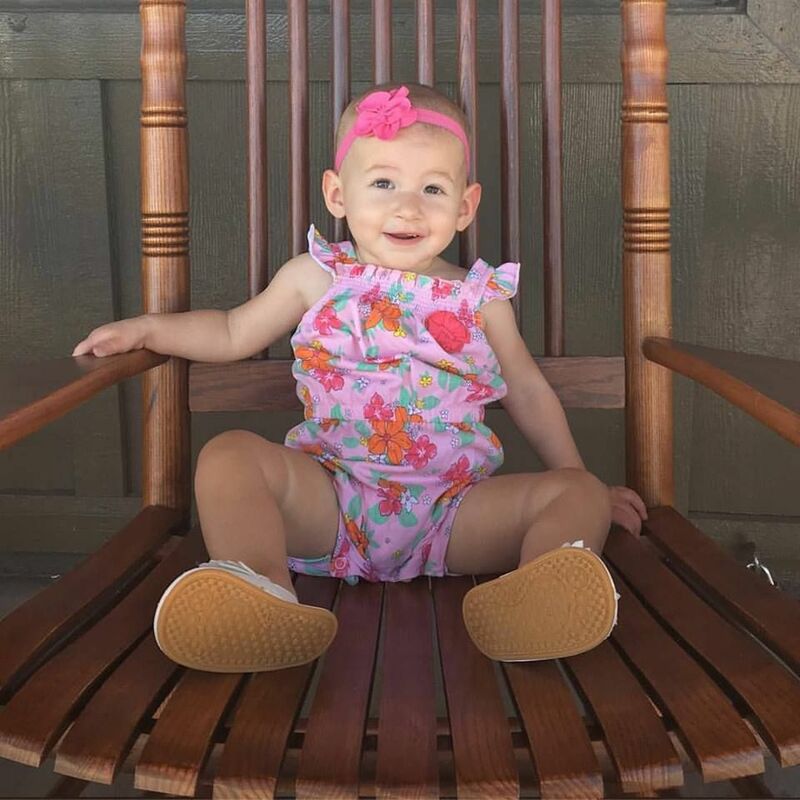 Before her grandparents and great grandma had to leave town on her birthday morning, we took Annabelle to Cracker Barrel for the first time, and she really enjoyed it. She ate SO MUCH FOOD (which she totally does now - she eats constantly all day long... I have no idea how she's so small!) and waved at every single person who walked by our table. She's such a flirt. 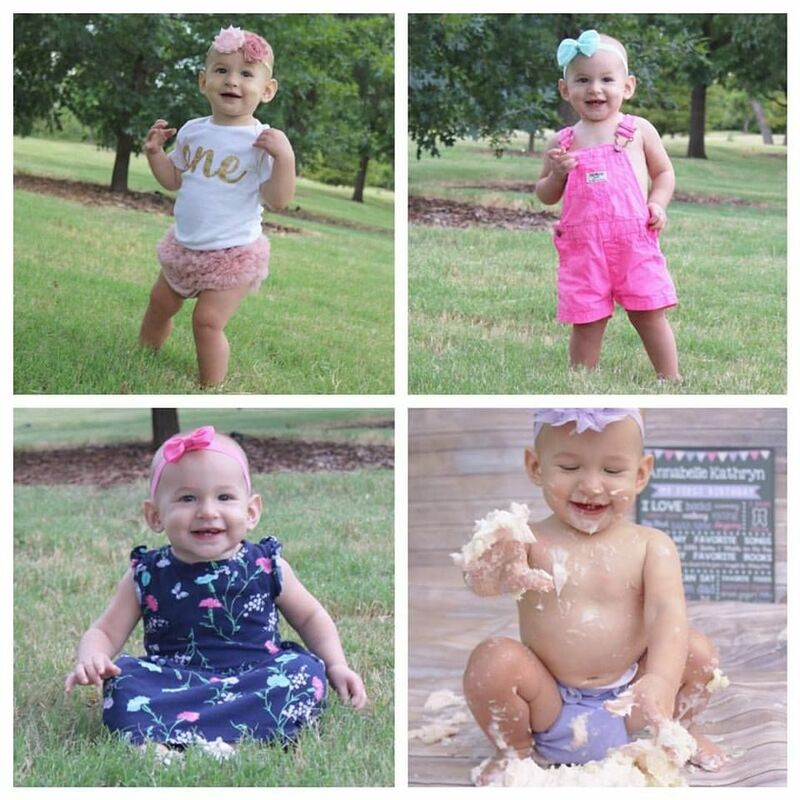 I can't believe that in one year, she's gone from the teeny tiny baby in the center to a big(ish) one year old! 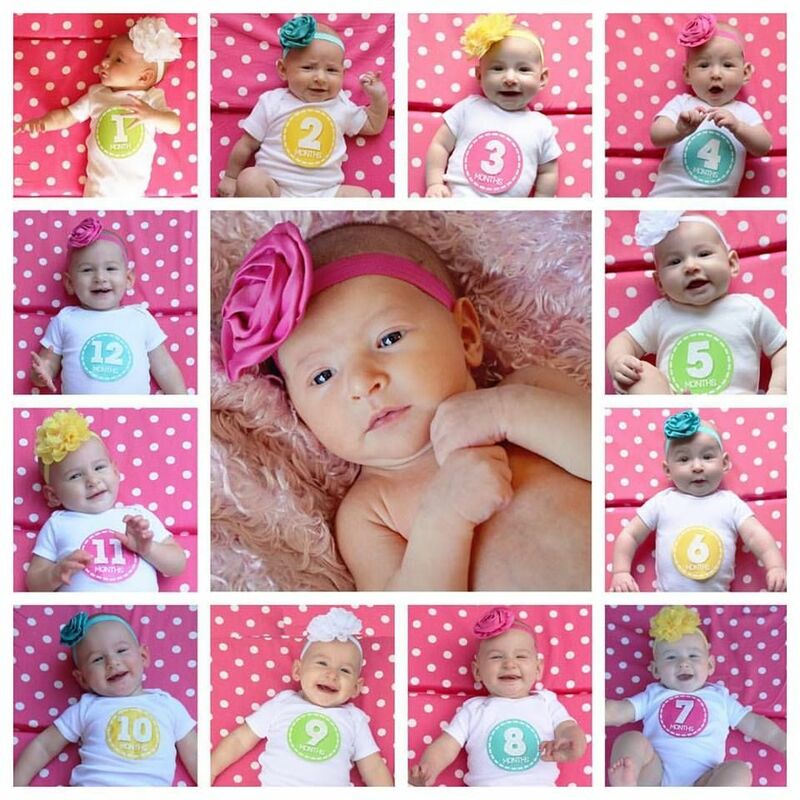 Time sure does fly once you have a sweet baby to spend all your time with. I won't be posting monthly updates anymore because it seems like overkill now. I really wanted to record her first year with as much detail as possible, though. Thanks for following along as I did that! 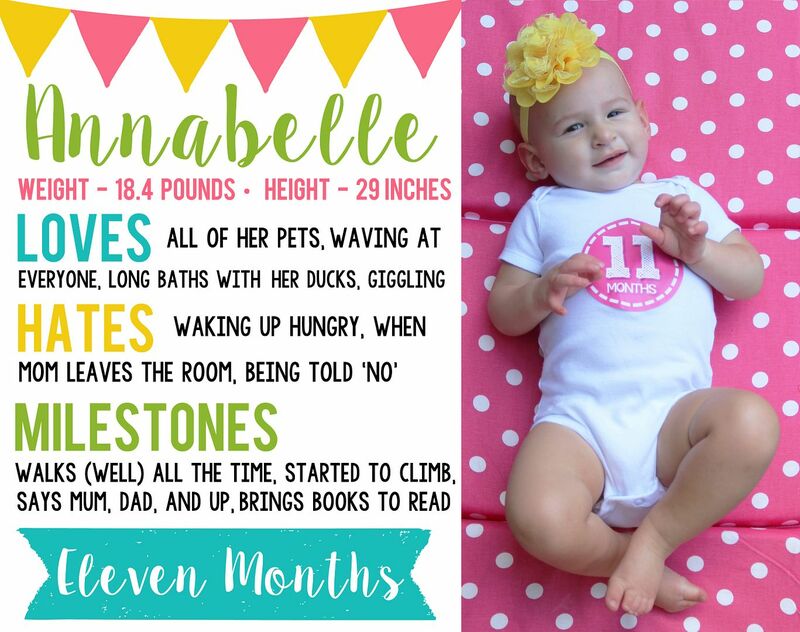 I will still share about Annabelle, of course, and post lots of pictures... and I'll probably make an update post about her every three months or so. 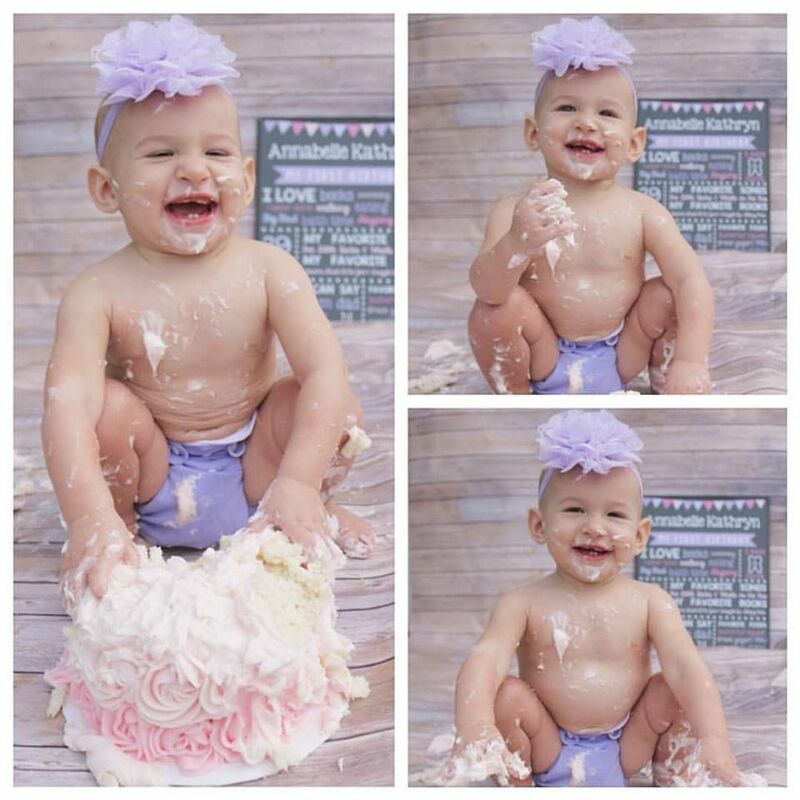 If you follow me on Instagram, you DEFINITELY know my sassy babe is a whole year old now... yet I somehow never got around to blogging her 11 month update, and in true Type-A personality fashion, I just can't let is slide by and skip straight to the 12 month update... so you can expect to see two Annabelle updates in a row on here before I can move on, and for that, I apologize. At least she's cute. This month was an exciting one full of lots of travel. 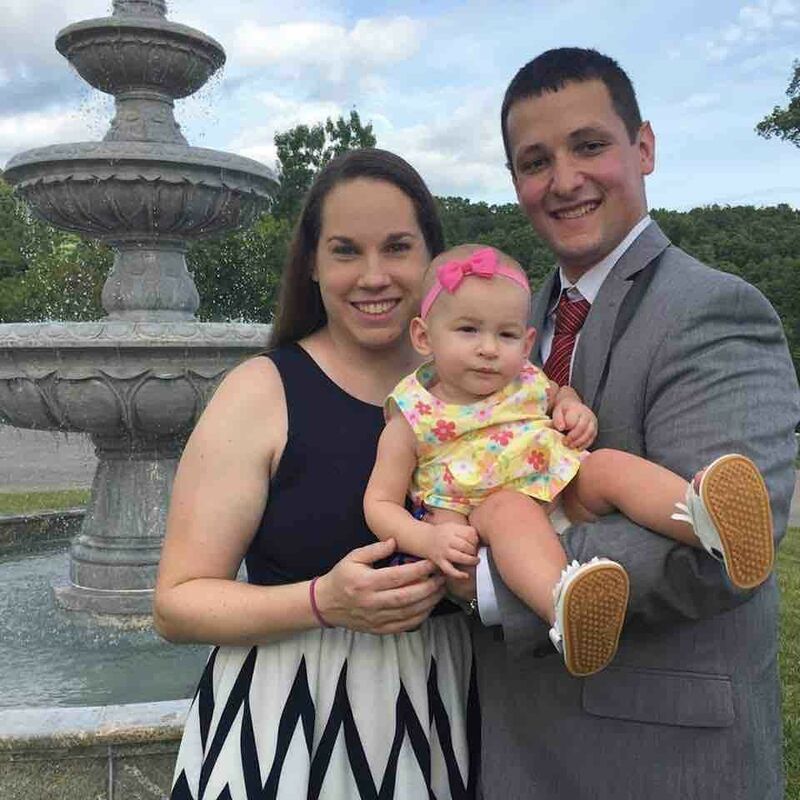 We road-tripped to Branson, MO to see Dan's cousin get married, and although it was a very quick weekend trip, it was really nice to see his family, and Annabelle of course enjoyed all the attention! She did NOT do so great in one of our hotel rooms (the one in Tulsa) - we had a VERY long night. But the rest of the trip was fun. A separate weekend, we drove down to Austin to visit a friend who was in town there, and that was another whirlwind trip. 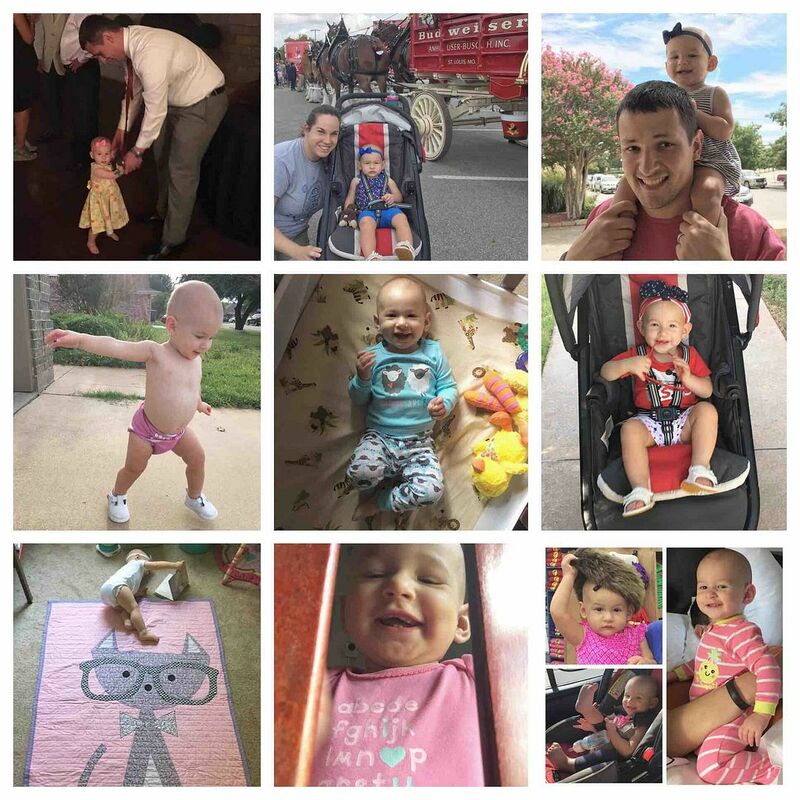 We also drove back to Kansas City at the end of the month, and Annabelle spent her very first night away from her mom and dad just one week before she turned one! She stayed with her Grammy and Great Meme, and she slept through the night for them - WHAT A STINKER! Other events this month include going to see the Budweiser Clydesdales on base, watching a TON of Olympics on TV, going on walks to the park, reading books (upside down, of course), and playing in the front yard while waiting for Daddy to get home from work. Annabelle is nonstop energy, and we parents wish we could bottle it up and use it when we need it. It would be far more effective than caffeine, but for now, that's all we have, so it'll have to do. She just runs around all day long, and she gets distracted easily, moving on from one toy to the next. I think we need to do some serious cleaning up of the toys so she isn't overwhelmed with so many options all the time - I read about putting various toys in separate storage type boxes and pulling out a new one each day for a week (and rotating through them) so kids will actually play with all of their toys, so we may try that soon. We'll see! 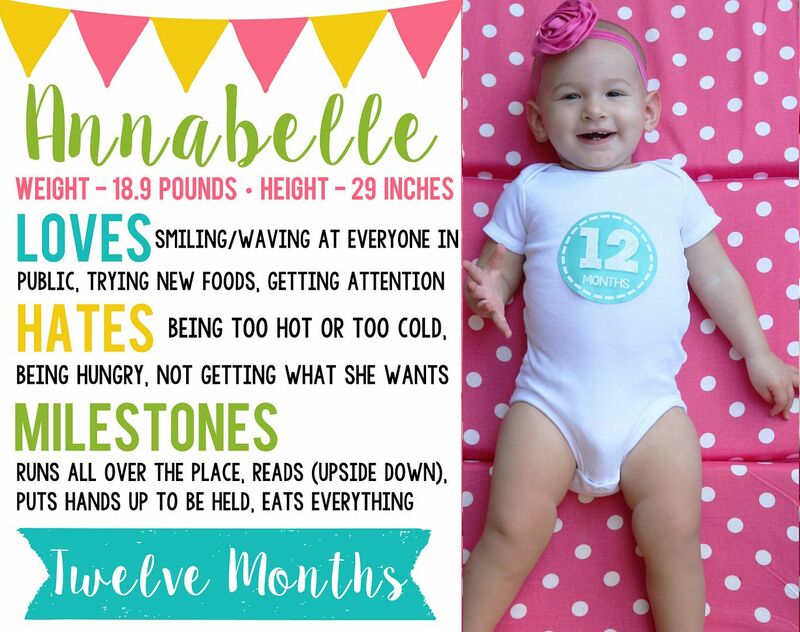 Annabelle was wearing size 3-6 months and 6 months clothing during her 11th month of life - she's tall, but she's a string bean for sure, so she wears smaller than average clothing (except footed pajamas since she's so tall). Her feet are still itty bitty - she's in a size 2, but they're way too long for her. She needs the size 2 because they're pretty chunky, though. I'm still so flabbergasted at how quickly time flies by. 11 months went by in a FLASH, and I can't even believe it!